Attractive 'Urban Crossover Vehicle' concept. 2.0 T-GDI, turbocharged gasoline direct injection and 7-DCT, 7-speed dual clutch transmission. Not thought likely to make production, but who knows? Hyundai Enduro 'Urban Crossover Utility Vehicle' (CUV) concept presented at the Seoul Motor Show in April 2014. Doesn't look as if it's seriously intended for production. The name ‘Enduro’ is derived from ‘Endurance.’ Also, Enduro visually combines SUV looks with rally motorcycles which compete in the world’s toughest rally events. The Enduro is designed as the perfect partner for individuals living in the modern city with energetic, athletic lifestyles. By combining robust forms with bold styling, Enduro releases a sense of adventure and freedom for driver and passengers. Enduro is ‘The Professional Gear’ for drivers wanting to escape from the ordinary. 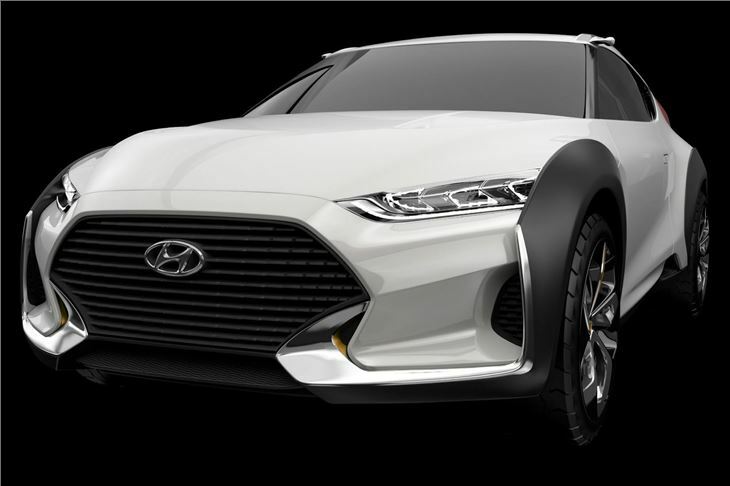 It features a new interpretation of Hyundai’s design signature hexagonal front grille, now with a lower center of gravity creating a sense of stability. An aluminum aero blade connects the front fender to the grille, giving the Enduro a look of self-confidence.